Between convenient flights, gear, and potential weather issues, traveling to the mountains can sometimes be stressful, here are a few pieces of advice that can make starting your vacation a bit easier! See below for some helpful links. Traveling with a lot of luggage, especially sports gear, has always been a hassle—even before the airlines starting charging exorbitant fees for checked baggage. The silver lining is that airline policies have given rise to an entire industry niche based on alternatives to checking your luggage. Ultimately, it’s become easier to pack lighter than ever before, even for gear-intensive sports like golf and skiing. The first option is to simply ship your sports gear so it’s at the resort when you arrive. This is easier and cheaper than it sounds, and the rise in airline baggage fees has happily coincided with a dramatic rise in e-commerce from companies like Amazon. The reason so many retailers now offer free shipping is because these larger volume users have driven their price for freight way down. So when you use a company like ShipSticks to send your golf clubs ahead of you, or sister company ShipSkis, they use the same services, FedEx and UPS, but pay less than half what it would cost you to ship it yourself. Rates for sending golf bags domestically start at about the same price as a checked bag, around $40. You can use the same luggage you usually travel with, no special bags or boxes necessary, and you simply book online, print the tags, and the shipper is automatically contacted to schedule a pick-up for you. At the end of the trip you just swap stickers and leave your luggage. A similar company called LuggageForward offers the same kind of service, but in addition to golf clubs and skis, it will ship any kind of luggage. Increasingly, winter travelers are shipping their bulky ski gear, clothes, and boots. If you can avoid checking bags altogether, it gets you out of the airport faster, and if you rent a car or just have a large family, not having to deal with all the bulky bags can be liberating. And, frankly, UPS and FedEx misplace a lot less stuff than the airlines. The only caveat for these services is that you must have faith that someone at the resort will be there to accept your delivery and in turn, give the shipper access to it after you have left. For this reason, these companies work best with higher end destinations like major golf resorts or a topflight ski resort like Beaver Creek, where all the hotels and condos are luxury properties with staff and services. Sometimes it doesn’t make sense to bring your skis at all, and instead of shipping, you might just leave them home. This is the second alternative to checking ski gear: renting it. Many children, beginners, and occasional skiers are just as well—or better off—renting and will probably get higher quality gear. Even advanced skiers may find it easier to just bring their boots instead of schlepping skis or a snowboard. At a luxury resort destination with higher end shops, you may even find that the rental shop has exactly the ski you already use, probably in a newer model and better tuned. Also, depending on where you live, your skis might not be ideal anyway. Speed skis that fly on East Coast hard-pack aren’t exactly ideal for deep powder days out West. When you rent from higher-end shops like RentSkis.com Gold, you can swap your gear repeatedly during your vacation if conditions change. But the best thing about the new generation of higher end ski rental companies, such as RentSkis.com and Black Tie Ski Delivery, that have popped up in the most luxurious ski destinations, is that they will deliver the gear right to your room. If you’ve done a ski trip with kids, you’ve likely gone through the process of arriving at a ski resort late in the day, then standing in line at a rental shop with already exhausted children, filling out endless forms, and trying to help everyone yank on boots among a dozen others clamoring for bench space. Just think how much better this would be if someone came to your room with the skis, snowboards, and an assortment of boots, the paperwork filled out in advance, and you sat by the fireplace with a glass of wine while the expert helped your family fit their boots. It’s a huge convenience for the luxury traveler visiting a resort like Beaver Creek, and that’s why these delivery rental services have boomed in the past few years. You can even pre-book your equipment choices from their fleet of high-end demos before you leave home to make sure you get exactly the model and size you want. It doesn’t get any easier. Flying in a private jet or commuting by helicopter conjures up images of rock stars and royalty, and in many cases it is the ultimate way to travel—but not always. Private transportation options of all kinds are great for luxury travelers to have in their toolboxes, but are better suited to some trips than others. Only a fraction of the private jets in personal use today are truly intercontinental, and many are not even transcontinental. Especially with the sudden rise of luxury suites on long-haul commercial flights (these are hotel-like cabins that go way beyond the spoils of even First Class), most travel experts will tell you that flying commercially on longer routes like New York to the Pacific Rim is still the most comfortable way to go. And even in these decadent cabins, it’s usually cheaper than private. On the other hand, private aviation has real benefits for travelers heading to smaller airports with less commercial service, who want to avoid lengthy layovers and plane changes. If you’re starting from a smaller destination, a private flight might even avoid two stopovers. This is even more important when bad weather arises. A cancellation can bump commercial passengers for days until enough seats have opened to absorb everyone from the cancelled flight. But even if your private flight is delayed by bad weather, when the clouds clear you can go home, without stress and worry. For all these reasons, and because so many ski resorts are served by smaller airports, private aviation has always been a popular choice for the luxury ski vacation traveler. 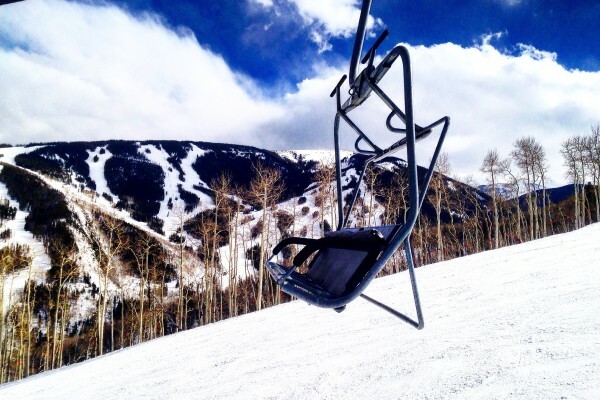 For example, there are few ski resorts in the United States considered more luxurious than Beaver Creek, and the Eagle-Vail airport is just 30 minutes away and within range of most private jets from anyplace in the country. And with the increasing popularity of very flexible fractional ownership jet programs like NetJets, even flying private one way and commercial the other can often make sense based on schedule. Flying private is more advantageous with a group, such as a family, because it costs the same for one passenger as four while commercial tickets do not. Finally, it is increasingly a choice of people who want to travel with their pets, and a large number of NetJets customers routinely bring their dogs on vacations—something they can’t easily do on commercial flights. Even if you take a private flight in, you still need to get from the airport to the resort. Go all out and transfer via helicopter for the fastest route. Beaver Creek has a dedicated helipad at the base of the mountain, and this is a great way to shorten airport transfers, especially from Denver where it can save almost two hours. And if you’re coming to Beaver Creek by ground, whether from Eagle or Denver, it’s smarter to splurge on a private chauffeured car or SUV from the resort’s partner company, Colorado Mountain Express, than to take one of CME’s scheduled group shuttles. First, the private car is ready and waiting as soon as you get your luggage, not up to an hour later; the car is on your schedule, not vice versa. Second, it’s private and more comfortable. Third, it goes straight where you need to go without stopping at several other hotels en route. It may be a small luxury, but it’s one more way to take the hassle out of vacation travel. By 2014 Olympic qualifier and Vail Valley resident Heidi Kloser Spring is here and it is probably my favorite time of the year to get out and free ski some bumps. I spend most of the winter traveling the world to compete in mogul skiing and don’t have very many opportunities throughout the winter to just go out and free ski.